One of my favorite meals to eat out is breakfast. It just seems special to linger over an extra cup of coffee and conversation after eating something besides my usual toast and peanut butter. Cracker Barrel, The Pancake Pantry in Nashville, and the Donut Hole all get a thumbs up from us! But one of my top breakfast places is Grayt Grounds on 30A. I love this little coffee shop located in an old house with funky decorations, lots of twinkling lights, vintage furnishings, and yummy food in this eclectic beach village. The last breakfast I had there was something the cook concocted for me from ingredients on hand that included scrambled eggs, grits, cheese, and spinach. YUM. I have even written a blogpost or two from the table in the corner. Sherry, the owner, is a BIG REASON the place draws us back time and again. (And obviously others since there is always a crowd.) Her nickname is The Hugger. She is very friendly and welcoming to everyone and has a cushion-y bosom. We hadn't been there too many times before she started including a hug for me in her welcome hello. On a visit last spring, I intentionally watched her when we stopped in to listen to live music on a random Wednesday evening. The small venue was packed and the crowd was very diverse in age-some early 20's all the way to quite a bit older than that. Brad and I arrived early and I did a lot of people watching while we waited for the show to begin. As the room started to fill, I noticed almost everyone in the place made sure Sherry saw them, and I could tell by the body language they were longing for a hug. Male and female, Sherry embraced each one and was genuinely happy to see them. Each one walked away from her with a smile on his/ her face. Did you know there is a lot of scientific evidence to support the importance of a simple hug? I listened to an interesting Ted Talk about stress that sent me on a search of the physical effects of this comforting human contact. 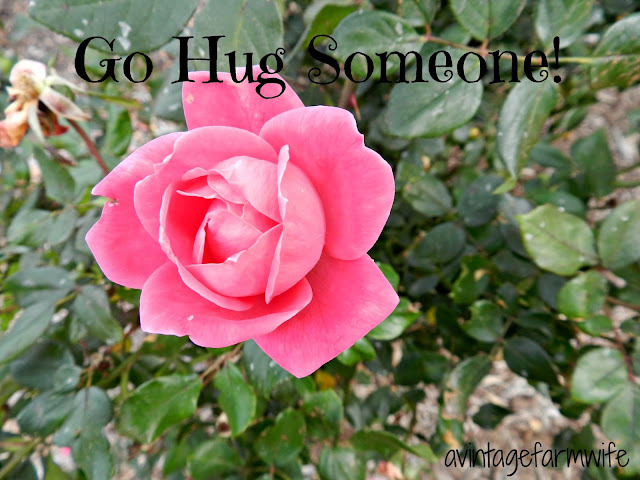 I discovered that when we are hugged, our bodies release the "happiness" hormone, oxytocin. The first time I ever heard about this hormone was when I breastfed our sons, but apparently, a lot more has been learned about it. We are MADE to be touched. All of this is more evidence to me that we are fearfully and wondrously made by a loving Creator. Since we are made in the image of God, HE must love hugs, too, and seems to have inserted healing powers within them. Our body is a marvelous thing. Our breath helps heal the body and spirit. Our words help heal the body and spirit. Our touch helps heal the body and spirit. Of course, medications are also a gift from God, but I think it is so amazing that HE hardwired all these healing modalities into our physical body. What can we do with this knowledge and the power of our hug? I plan to look around for those who I know could use a boost....the widow, single women, the stressed out (I guess that includes everyone! )....and give them a big hug. How about you? Maybe you are the person who can give a hug today, or maybe you could use one yourself. Let's make a deal. If we ever meet in person, I will hug you and you can hug me! Sad Sidebar: I was so disappointed a few weeks ago when I took friends to meet The Hugger and discovered the little coffee shop has closed due to unforeseen circumstance. I may never see Sherry again, but her sweet spirit and warm hug impacted my life, and I will pass it on. Whoopsie Sidebar: I wrote this post some time ago and forgot to hit "Publish". No wonder no one read it. It's still very true!